Happy Monday! St. Patrick’s Day season has begun, folks, starting this past weekend with a successfully short Am O’Gansett parade, pictured above, taking up about 15 minutes of our day on Saturday. For such a brief parade — supposedly one of America’s shortest — it managed to pack in a lot, from headress-wearing Neo-Political Cowgirls to Mr. Amagansett himself, Tom Muse, wearing a pink-skull-bedazzled suit. (Muse, by the way, won his title by wowing the crowd at Stephen Talkhouse with a version of Elton John’s “Candle in the Wind” dedicated to Yogi Bob, the missing Hamptons pet.) Meanwhile, over in Westhampton, there was much green, much merriment, and much coneheads. On tap for this coming Sunday: The always impressive, somewhat feared Montauk Friends of Erin parade. We hear some exiting news: Pierre Weber, of Bridgehampton restaurant fame, is taking over the Sagg General Store in Sagaponack. He apparently plans to continue to operate the market as a general store, but with more food choices, and it will be renamed Pierre’s. He told the East Hampton Press that he wants to provide service to “the local people—not just the weekend people.” Bien sûr. 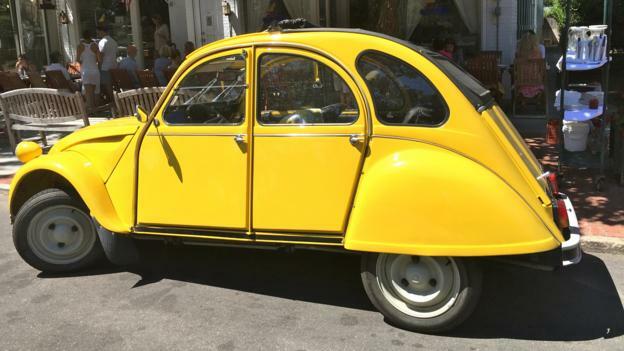 No word yet on whether Pierre’s yellow Citroën will be parked outside. East Hampton Indoor Tennis is seeking names for its new recreational facility that will feature bowling, mini-golf, and a “world-class” sports bar, and invites the general public to submit name ideas here. It is also accepting submissions for logo designs. Presumably it will actually build the facility itself. Winner gets one year of free bowling and mini-golf, plus a dinner for four….Meeting House restaurant in Amagansett, which recently re-opened after winter maintenance, announces that artichoke is back on its menu, for all those who were concerned… The artist Grant Haffner of rainbow-hued-utility-pole-art fame is headed to Massachusetts to seek further fame and fortune. At least we’ll always have his Instagram account. “Popularity of growing beets is increasing as root vegetables experience a culinary renaissance.” — Charlie Whitmore Gardens of Amangansett, as it posted this ode to beets on Facebook. We’re rooting for a big root vegetable comeback. Be the first to comment on "Daily Bee: Parades & Pierre’s, Plus, A Year of Free Bowling! And Beets."